Oh WOW !! You have snow and a Aurora .....Its beautiful . 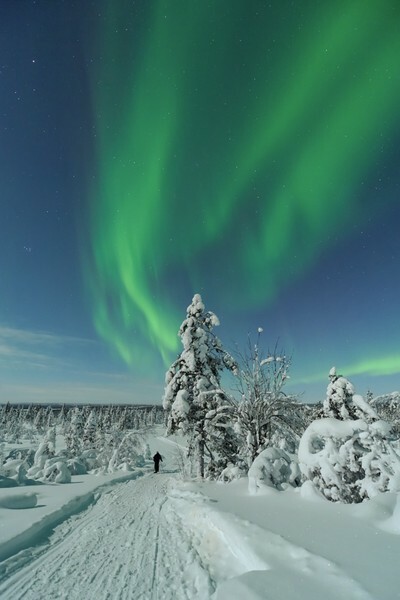 It's most common here to have snow and auroras :) Aurora australis is on my bucket list! I love pictures of the aurora, they are like finger print in the sky no two are the same. It's beautiful shot. Wow. Love this and the title says it all. Beautiful capture. Wow, very beatiful photo ! yeah, the moonlight makes so much difference. Cheers! Congrats on your award. Your photo has inspired me to go and ski where you can see the Auroras! Gorgeous. This is on my bucket list of photos to take. Love it. Try to see them, it's so worth it! Green auroras in the night skies of Lapland. Moonlight is brightening the winter landscape.